Spend another £29.64 to get FREE DELIVERY! 100mm Extractor Single Speed, SELV w/ Humidistat, Timer & Pull Cord. SELV 12V to meet the preferences of both specifiers and installers. The remotely mounted transformer contains switch line control. The Select 100 range of bathroom and wc extractor fans are ideal for todays new build projects, designed to comply with the airflow rates as laid out in Building Regulations ADF: 2010. 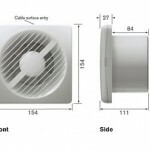 Providing typical ‘ON-OFF’ ventilation or intermittent extract, the axial flow fan is suitable for wall and ceiling installations in houses and apartments.